High blood pressure increases your risk for heart disease, stroke and kidney disease. A balanced diet with plenty of vegetables can help you maintain a healthy blood pressure or lower high blood pressure, and pickled beets are a tasty part of a healthy diet. Pickled beets are not as beneficial as plain vegetables and are best enjoyed in moderation. You can buy pickled beets in a jar or can, or make them yourself with beets, vinegar, sugar and salt. Most vegetables are good sources of potassium and each cup of pickled beets supplies 349 mg. Potassium is an essential electrolyte for regulating your blood pressure, and healthy adults should get at least 4,700 mg per day, according to the 2010 Dietary Guidelines from the U.S. Department of Health and Human Services. 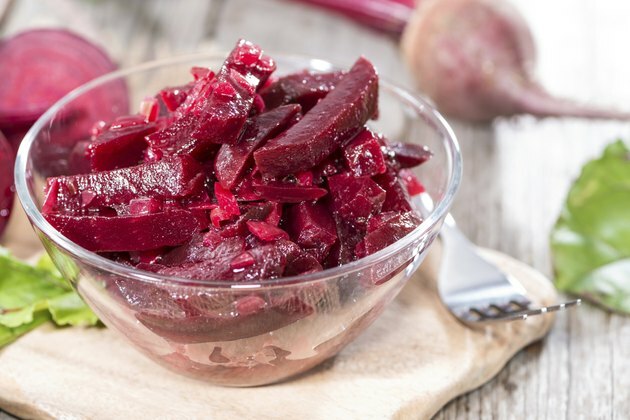 A cup of pickled beets supplies 5.9 g dietary fiber, which can help you maintain a healthy blood pressure, according to the Linus Pauling Institute Micronutrient Information Center. Pickled beets may contribute to high blood pressure because they have 599 mg of sodium per cup. High sodium levels are bad for your blood pressure and healthy adults should have no more than 2,300 mg per day, according to the 2010 Dietary Guidelines from the U.S. Department of Health and Human Services. The recommended limit for individuals with hypertension is 1,500 mg per day. Most vegetables are naturally low in sodium, and cooked beets without added salt have only 52 mg sodium per cup. With 148 calories per cup, pickled beets are higher in calories than most plain vegetables. Obesity increases your risk for developing or maintaining a high blood pressure, and you will gain weight if you eat more calories than you expend. You are more likely to eat too many calories when you choose calorie-dense foods, such as those with added sugars. Canned beets without added sugars provide only 69 calories per cup. The Dietary Approaches to Stop Hypertension, or DASH, diet, is an eating pattern that may help you control your blood pressure, according to the 2010 Dietary Guidelines from the U.S. Department of Health and Human Services. Pickled beets can help you meet recommendations to get four to five servings of vegetables per day on a 2,000-calorie DASH diet. The DASH diet suggests eating a variety of vegetables, as well as fruits, whole grains, healthy fats, lean proteins and low-fat dairy products to get a range of nutrients for a healthy blood pressure.